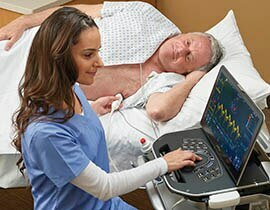 More accurate ultrasound needle guidance. The control you'd expect from a tablet. 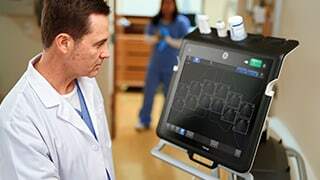 Enjoy familiar tablet functionality - pinch, slide or tap - even with gloves on. *Use of Pinpoint™ GT from C.R. Bard technology feature compared to conventional needle guidance. 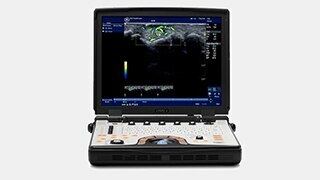 Now offering Pinpoint™ GT technology - the Venue™ 50 with Pinpoint GT enables greater control over needle placement with twice the accuracy of conventional ultrasound needle guidance*. *Use of Pinpoint GT from C.R. Bard technology feature compared to conventional needle guidance. See the needle tip. Two types of ultrasound - one for tissue and one for metal - help you see the needle tip clearly. See how Pinpoint GT works. *Use of Pinpoint™GT from C.R. Bard technology feature compared to conventional needle guidance. 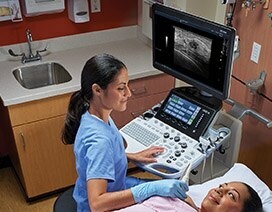 Watch a variety of instructional videos highlighting system overview, image modes, measurement and annotation and more for the Venue 50 Ultrasound System.